For thousands of years, doors have been providing security and protection from harsh climates and naughty trespassers, as well as welcoming family and guests into the home. With gazillions of door materials, colours, finishes, textures, hardware options and configurations, a door has the potential to make a bold unique personality statement, or it can blend beautifully into the nature and style of your home - from the inside and out. 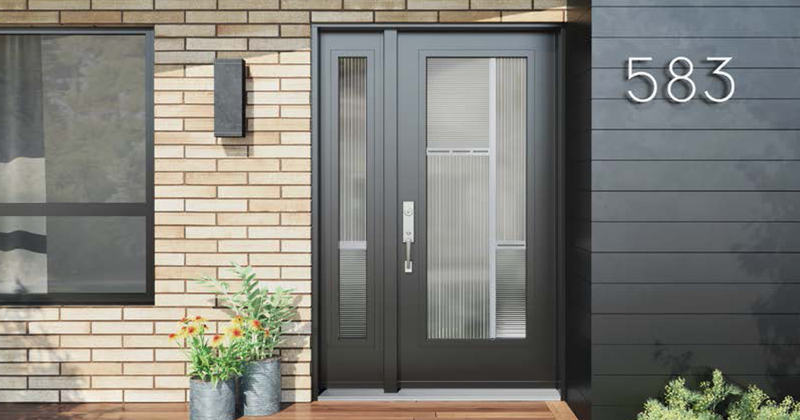 Advances in fabrication and materials have lead to the preferred choice of steel and fibreglass doors for most door replacement projects, but wood doors still provide a beautiful natural warm desired solution to many. Wood, Fibreglass, Steel and so many options! It’s easy to get lost in the details of picking out a door that will suit all your aesthetic and security requirements. We’ve compiled a few helpful facts and details to consider before you seek out your new door. Steel doors are the most common type of replacement entry door sold today, they are strong, durable and affordable. Made from heavy gauge galvanized steel, coated with zinc (to prevent rusting) and with a solid polyurethane foam core that provides superior insulation qualities. These doors are resistant to warping, shrinking or swelling, however, they are more vulnerable to dents and scratches than wooden or fibreglass doors. Advanced metal stamping and embossing techniques allow steel doors to be made into a variety of stamped shapes and patterns and some manufacturers can even create faux woodgrain patterns. Many manufacturers have a broad selection of colours and glass inserts and some even allow for custom colours. Fibreglass doors are typically a little more expensive than steel doors, they are durable and very well suited to Canada’s sometimes nasty climate. Built with an energy-efficient solid polyurethane core, these doors provide great insulation properties and they will not rust, dent, split or delaminate. As an alternative to wooden doors, these doors can be textured and coloured to resemble natural wood grains that will maintain their original, natural-looking beauty. As with steel doors, fibreglass door panels can easily be fabricated into a wide variety of shapes and textures. The standard for thousands of years, wood doors are still a great option if you’re looking to create something unique for your home. Wooden doors are typically much more expensive than steel or fibreglass doors and there can be a significant price difference between inexpensive wood composite materials and higher-end hardwoods. Natural wood products must be maintained on a regular basis to prevent the paint from fading or peeling, and although wooden doors are prone to warping, splitting or cracking over time, improved fabrication techniques make them far more resistant to the pressures of humidity and temperature change than in the past. As with all things constructed, not all door frames are equal, a solid, well-installed door frame will help ensure smooth consistent operation over the lifespan of the door. Most door replacement projects are simply a case of replacing what’s already there, but there are plenty of possibilities available, as long as you are working within the same dimensions. Even if you desire a larger opening, it may be possible as long as it does not affect the structural integrity of your home. Talk to a door installation professional or consultant about your vision, and they’ll help you understand what will work, and obstacles might have to be overcome. Most door manufacturers offer a plethora of styles to match your home or to enable you to unleash your imagination. There are plenty of standard and modern styles to choose from. Be sure to tell your door consultant exactly what you want, they’ll be able to show you reference materials and caution you on the pros and possible cons of what you are looking for. Most entrance door manufacturers offer a broad range of standard door colours and finishes. Talk to a door specialist about the colour you want, some door manufacturers offer custom colours to match your exact specifications. Door locks and handles and even hinges should compliment the design of your door. Most door installation companies are partnered with many leading hardware brands in order to offer their clients a broad selection of locks, handles and hinges. There are lots of different styles, shapes, colours and finishes available. Your door expert can show you samples and reference materials to help you quickly find and make a perfect choice. There are many entrance door replacement and installation companies in and around the Ottawa area that claim they have the best door warranty in the business. Unfortunately, in terms of warranty the language used can be vague or suggestive and full of fine print that is difficult to interpret. Every door installation company is different and even companies that sell and install the same product will practice differing warranties. The warranty is an important part of your front door purchase. So when talking to door installation companies ask lots of questions and don’t assume anything. It will be worth it in the long run. How long is the product warranted? Will labour and parts be covered through the life of the warranty? Is the installation covered under the warranty? How log will it take to have someone assess a warranty issue if there is one? Installation is the most important parts of an entrance door installation. It’s crucial that the installers are trained professionals that are up-to-date with industry standards, work efficiently in the safest way possible, and use the right tools. One way to make sure that an installer is to find a SAWDAC or Window wise installer. Professional certified installers adhere to the strict installation guidelines and use only top-quality materials and supplies to ensure the highest level of quality and greatest energy efficiency possible. The anatomy of a entrance door - hundreds of years in development.